As an Information Technology services provider, Stratagem Technical Services, LLC (Stratagem Technical Services) enables their customers to realize the highest possible returns on their technology investment. We provide professional, cost-effective service and support for the personal, small business, and larger corporate communities. Stratagem Technical Services was founded by Troy Van Marter, who serves as the company's president. 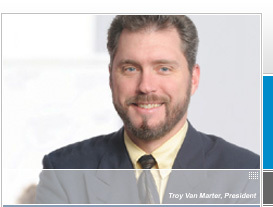 Troy has over 23 years experience in technology, having held numerous senior corporate leadership roles. His primary focus has been within Information Technology organizations, such as IBM and Reuters. He has also played key roles in directing technical infrastructure development for start-up technology corporations. Specifically, Troy has developed and led Business Management and Communications teams responsible for technical support & consulting, networking and telecommunications on a global scale. His experience includes restructuring IT services and support infrastructure and processes at Reuters America, saving them over a quarter of a million dollars in its first year due to renegotiated contracts and efficiency gains. Troy was also critical in the development and implementation of corporate wide IT standards at Reuters and directing the “Global Employee Efficiency Measurements Program” (EEMP). This program includes the conduct of regular employee surveys, measuring not only satisfaction with, but efficiencies gained through IT services. The analysis resulting from this program provided guidance to the Chief Information Officer, as to which technical services required enhancement throughout the entire organization. In addition to being an executive and technology advocate, Troy is also an active volunteer in his community. He is involved in a number of non-profit organizations. Most notably, having served as acting Vice president and CTO of TheRealityCheck.org, Inc., and providing technical consulting and Internet services to Kids Alive International, The Bridgeport Rescue Mission, American Society of Interior Designers, Connecticut Chapter, The Food Bank of Lower Fairfield County, Inc. and many others. He has also provided numerous technical services for other Christian based organizations and missionaries, as well as for individuals on the secular level. Personal Motto: Philippians 2:4-5 "Each of you should look not only to your own interests, but also to the interests of others. Your attitude should be the same as that of Christ Jesus." Stratagem Technical Services provides client support services to International Counterintelligence Services, Inc.™ (ICS®). Company brief: Private investigators at International Counterintelligence Services, Inc. and their supporting group of forensic experts, counterintelligence agents, and legal information specialists consistently get results for all types of clients. Each member of their staff is trained, experienced and works for you in Client Services Groups specializing in most areas of private investigations. Each of these units are available using their 24 hour rapid response operations. These men and women are dedicated, ready to help you and will be able to deploy a team of highly-credentialed experts to work on your case, rather than relying on just one person. Their efficiency and teamwork saves you time and maintains integrity throughout the case process. Many of their agents are members of their bilingual private investigator group, and are cultural, national, and gender diverse. When you need a private investigator for personal matters, or if you are a legal professional, you can count on a qualified private investigator with the ICS team. They can be reached on call 24 hours a day and seven days a week, online or by calling toll free (800) 828-9198.
so must he be all through the days of eternity." coming to faith in Jesus Christ. Part 1, Part 2. Stratagem Technical Services, LLC is a member of the following organizations and others.